All of ERS's Hazardous Materials Emergency Response Courses are designed to meet or exceed the requirements of OSHA's 29 CFR 1910.120(q) and NFPA 472 competencies for haz-mat emergency responders at your facility at whatever level of competency you choose. This course is directed at those personnel who could be the first on the scene at a haz-mat release. 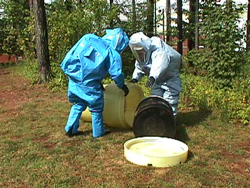 Training is emphasized on recognizing the presence of a hazardous material, identification procedures through the use of the DOT's North American Emergency Response Guidebook, securing the hazard area, self-protection, population protection, and environmental effects of the release, as well as initiating the response of more highly trained responders. This course builds upon the lessons learned in the prerequisite haz-mat awareness course and is designed for those responders who may be responding to a haz-mat release in order to protect nearby personnel and control the release with defensive product control procedures, if possible. The course concentrates on controlling the incident scene, hazard and risk assessment, the operations level responders role in the Incident Management System and defensive product control techniques. This intensive 24 to 40 hour (minimum) course is directed at the emergency responder who responds to spills for the purpose of controlling the leak at it's source by utilizing personal protective equipment and specialized leak control equipment. Instruction is concentrated on topics such as hazardous materials containers, atmospheric monitoring, hazardous materials properties and tendencies, predicting the likely behavior of the haz-mat, selection and use of personal protective equipment, decontamination procedures, and offensive spill control techniques. The course is packed with field scenarios that put the student as close to the real thing as possible. When participating in the field scenarios, the students also are required to operate within the Incident Management System for hazardous materials emergencies. The Hazardous Materials Technician Training Course provides excellent training for your haz-mat teams at your facility.